Giving the windows in your home a fresh new look doesn’t mean having to cough up thousands of dollars to have new Andersen windows installed. In fact, you’ll be shocked at how little you can spend to get a whole new look. 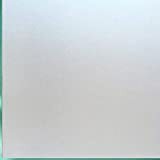 Coavas Non Adhesive Frosted Glass Window Film is available on Amazon for just $7 per roll, and each roll is about 6.5 feet long by 1.5 feet wide. This awesome film attaches to any window, shower door, or any other glass in your home in a matter of seconds without any adhesive, and you can make all sorts of awesome modern patterns with it.